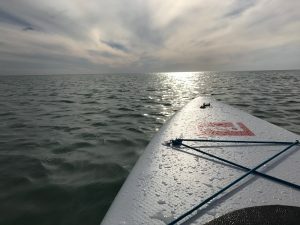 Since starting to SUP 4 years ago I have heard about inflatable boards but I have always stayed well clear of them, concerned that they would lack the rigidity of solid boards, they would blow away in the winds, and worst of all would they slowly deflate as I paddled along the coastline and all the other horror stories. However having watched the technology improve over the years and the manufacturers making more and more claims that the new boards are as good if not better than their solid counterparts, I decided that if I am going to take a board with me, now may be a great time to try it. All the reviews seemed to indicate that this was a great piece of kit so I sat back and waited for it to arrive. A couple of days later the box was in my possession, and as I was in a hotel room no-where by the sea at the time, I did exactly what anyone would do in my position and immediately inflated it in the hotel room (I have no idea what they neighbouring guests must have thought with those noises going on!) It took about 5 minutes to get the board up to the 15-18PSI, I admit I am not the fittest and therefore I did stop to rest a couple of times. Once inflated the board certainly felt like it would be a nice solid platform to paddle off. One word of warning though, when you deflate these boards they are not the quietest things so if you happen to be doing that in a hotel room, or on a packed beach for that matter, it may be best to warn anyone nearby just in case they have a weak heart! Aside from the board, the paddle looked, and felt, well made solid and light, the pump worked as expected and I got the hang of using only the smaller piston whenever I found that putting all my 14 stone frame would not push in any more air using both cylinders! The standard removable FCS fin was nice as I could use my other fins with the board should I like and the bag looked sturdy enough with more handles and shoulder straps than I thought I could make use of. There was only one real problem which was what do I do for the kayaker in the family? 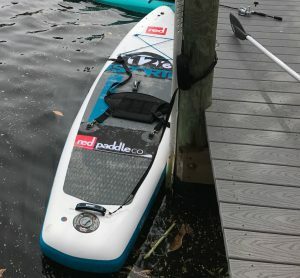 A quick search on ebay and I found a possible solution in a SUP kayak seat from Aqua Marina, and an all in one SUP/kayak paddle. I was initially dubious that these would work with my new board as there were not enough strap hooks on the Red 12’6 sport as I needed to attachment points behind the centre of the board, so I had to purchase a couple of additional adhesive D hooks. The D hooks arrived and I used SUP repair adhesive to attach them to my new board. The new hooks came with a black background and as you can see in the photos attached to the article they fitted perfectly in the black area of the board just behind the middle of the board. Once these were attached and dry the seat fitted perfectly, the only issue I had was that whilst the attachment points were drying overnight one of the dogs decided to sleep on the board and had scratched up the middle of the board whilst trying to make it more comfortable. I guess firstly I should be relieved it was not one of the cats that decided to do that, and secondly the fact the board survived with just some cosmetic damage shows how tough it is. The next problem I came across was when I was packing to travel, the bag that is supplied was bigger than my aircraft allowance by some margin, so I would have to pack it and leave space for the top of the bag to crumple. The Red Paddle Co bag that comes with the board has internal straps to hold a few of the items in place so that was not too bad. But then disaster! The combined height width and depth of the bag meant that there was only a couple of inches spare above the width of the board to keep within the airline allowances, so my three piece paddles could not be any higher. Unfortunately this meant there was no way that my new fibreglass paddle middle section could go with me as it was just too long. To be honest I was also wary of leaving that part of the paddle sticking out unprotected through the baggage handlers so I had to leave my nice new fibreglass paddle at home. Luckily the Kayak/SUP convertible paddle fitted perfectly so I would have to make do with that. All the remaining accessories including the seat fitted easily in the bag I locked the bag using a USA friendly padlock (annoyingly the main zip does not have a lock fitting so I locked it through the pull rings) and we were ready for the adventure. Checking the bag in as the airport went well as it was checked with the rest of the luggage, as we were in economy my actual luggage was spread across everyone else’s suitcases so there was no additional baggage charge to pay. As we were saving money we had a change in the US to get to Tampa Airport so we picked the bags up in Atlanta and put them back on the plane for the final hop. It was late when we arrived at the villa so we dumped the bags and went pretty much straight to sleep. 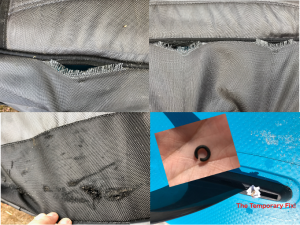 In the morning I checked the bag for any damage from the trip, unfortunately the bag had not made it through the journey in pristine condition. 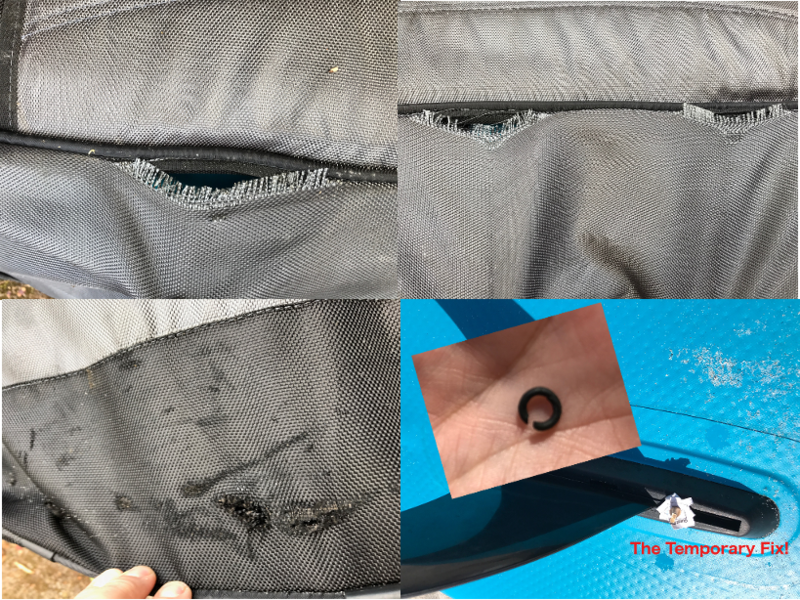 It seemed that the lock that was holding the zipper closed must have caught on something as whilst the lock was still attached to both zipper pulls, one of the zipper pulls was no longer attached to its zip. Where the side handles were attached to the canvas of the bag the canvas must not have been able to take the weight of the contents and the canvas had stretched and looked like a pair of tights that had run, and finally although the bag comes with perfectly capable wheels, some clever sole had decided to drag the bag across the floor on its side, wearing the bag through. Luckily though the pounding the bag had taken had saved the contents and my board and the other accessories were still safe. This is the Red Paddle Co. 12’6 sport with the seat from Anna Maria fitted and the convertible paddle. 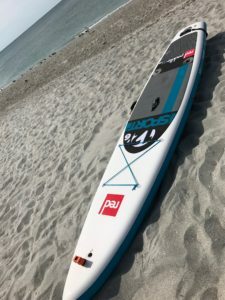 The Red Paddle Co. 12’6 sport on the beach at Captiva without the Kayak fittings, but with a go-pro! 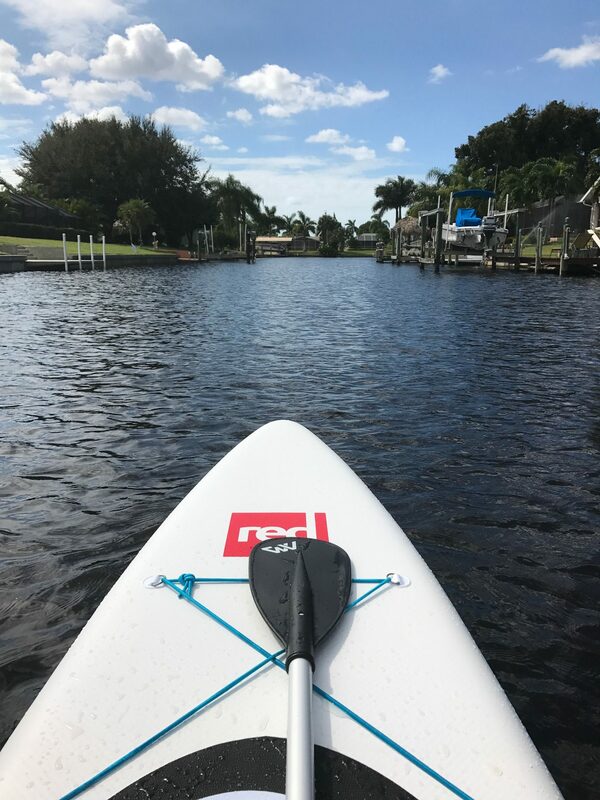 Over the holiday the board proved it’s worth, as a paddle board for me it was absolutely great and rode out some ‘rough enough’ for me conditions on the wind-swept bay off Cape Coral. 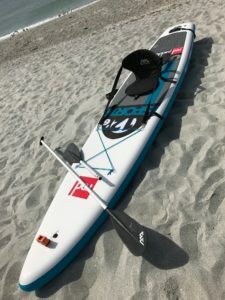 In the small surf there was off the Captiva beaches, the board was a very stable ride and it’s 12’6 length was surprisingly manoeuvrable. There was a little bounce in the tip on rough water but due to the stabilising rods in the rails it was hardly noticeable. 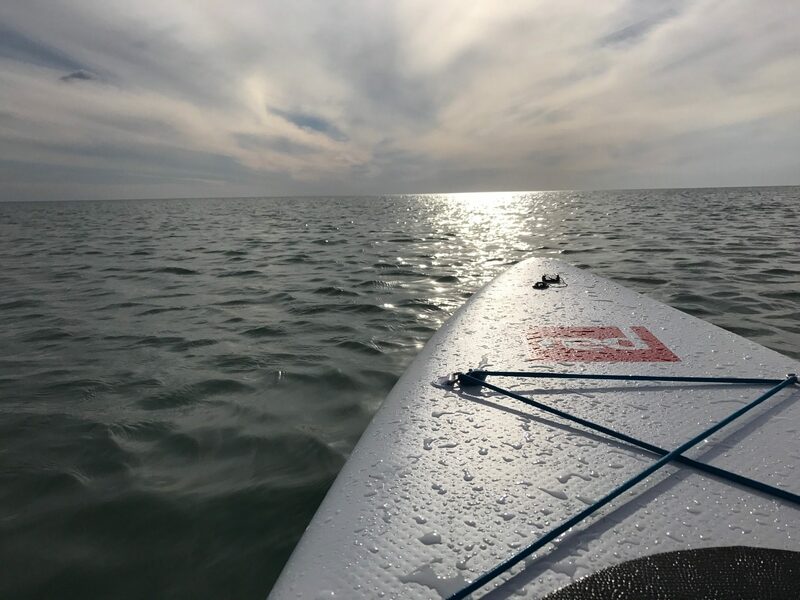 On the calm days it glided through the waters of the back canals with ease and very little resistance, and even with my £25 two in one paddle I managed to make very good progress and it was an absolute pleasure to use. When the kids found two kayaks that came with the villa, the board was converted into ‘kayak’ mode and it was soon considered to be the fastest of the three vessels! Taking in the view in the canals behind the vacation property! The board is light enough to lift up to the pier and also stable enough to step down onto it! On the days we went to the beach the SUP was deflated, packed thrown in the back of the car and taken with us. Even in the Florida heat, it rarely took more than the usual 5mins to set up and once inflated it stayed that way all day until we were ready to go home again. One tip – remember, pump it to 1PSI then put the rods in the sides, there is nothing more annoying than forgetting and having to start again! Sitting looking out into the Gulf of Mexico waiting for the dolphins to come back! In the mean time it would be used by everyone as a Kayak, SUP, a diving board or a even a bed on the sand! The board was solid enough to take two teenagers, and occasionally three (although at this point it did start get low in the water!) One thing we did find was that whilst most years anyone who did not fancy having a go would sit at home whilst we hired boards etc., this year as the board was always just there, they would just stand up and give it a go whenever no one else was using it. In fact it was the first year that everyone we went with got on a board on the water to do something even if it was to just sit on the board in the surf! The brass(?) fin screw seemed to corrode and became increasingly difficult to tighten/undo. Could be fixed with a dab of oil, but have not had this with a fin before. So was it worth it? Yes I think it was, the inflatable solved the problem of getting a good board to use on holiday, it solved the problem of how to get the board to the beach (this happens if you rent a board for a few days whilst you are abroad). Because it was so easy to get around, we got much more use out of it than we would a rented board, and not only that everyone seemed to want to have a go just because it was there. As a final thought, the other family we went with were so impressed at how easy it was, they would like to borrow it for their own vacation this year! So if you are looking for a second board and have been thinking about an inflatable like I was, then I would strongly suggest this is a great board to do it with. If you are lucky you may even be able to find a local SUP store that will rent you an inflatable to take with you!